Yesterday my husband and I watched the Season Finale of MasterChef Australia Season 10 with a heavy heart. While both of us had rooted for Sashi and he is a truly deserving winner, we felt really heartbroken for the other wonderful finalist Ben. And now the 9 o’ clock dinner slot feels strangely empty, with nothing to make us work up an appetite for our boring plate of roti-sabzi. I feel like MasterChef Australia has revitalized not just the food scene but also the vocabulary we use for food. It has been nothing short of educational to hear Gary call a dish “more-ish” or say “I’m salivating” with a childlike grin, or hear all three of these exuberant men talk of texture and crunch. The words we throw about oh-so-casually now such as ganache and anglaise and consomme and sous-vide have all become a part of our consciousness because of MasterChef Australia. And no-one in the family is immune. From the little girl who uses beads and magnet tiles for ‘presentation’ to the mum who fries papads for ‘crunchiness’ to Abba who simultaneously wonders at the minimalist plating and drools over the juicy, pink, meats everyone wants to be in front of the TV when the show starts. Here is a fun article from Arré talking about just that. Over ten years, MasterChef Australia has proved to be good-quality entertainment for the whole clan. I have watched MasterChef USA, MasterChef India and even parts of MasterChef Asia which feature Audra Morrice who made it to the top 3 of MasterChef Australia in 2012. However, none of these formats come close to even capturing the magic of the Australian version. I’ve thought about this for months now. What makes shows in similar formats differ from each other? And what makes this particular version stand out? Is it the three judges; warm and kind and objective and completely in love with their plates of food? is it the quality of the contestants themselves and the culture of the country? Is it the lighting and the camera angles? I started watching MasterChef Australia from Season 2 and my husband hopped on from Season 3 or “the one with Dani” as he likes to call it and we have had many conversations about this. A while ago he told me of a discussion he had many years ago with friends which may answer my burning question of what really makes MasterChef Australia so good. The topic of their debate was whether systems determine and influence individual behavior or whether it is actually the other way round. My immediate instinctive reaction is to believe that individual behavior matters more and should not be subject to the systems around. And there are countless, uplifting examples of this, especially in times of hardship where we see how the human spirit triumphs and thrives in spite of what is around (Anne Frank and Aibileen Clark immediately spring to mind). But the husband’s resonant tone and reasonable arguments also make me think about how certain systems make us behave in a certain way. Schools are a wonderful example of this. Thinking back to your days in the classroom, do you remember the relationship between you and your classmates when it came to punishments and rewards? Was the teacher’s pet always rewarded for telling on others or discouraged? Did the appointed leaders stand up for or separate themselves from the troublemakers for fear of punishment? In spite of being a competition, the MasterChef Australia format is extremely collaborative. Contestants on all seasons seem to like each other and forge meaningful connections and friendships. They aren’t encouraged to talk about each other in a negative light. This is in stark contrast to a horrendous season of MasterChef USA that I watched. On MasterChef USA, the two worst performers of a team challenge were nominated by the team captain to go into elimination. This harbored bad blood between the contestants, ill-feeling towards the captain and a tendency to watch out for your own neck, instead of looking out for the team. How wonderfully Masterchef Australia has sidestepped that pit by sending the entire losing team into elimination. Very often, individual star-performers have gone into elimination because the entire team lost. The contestants too take this in their spirit. I find it so important to cultivate this sense of team spirit even at home as a family. I have seen many Indian families where the child is closer to one parent (usually the mum) and this continues for years where the kids and mum are on one side, completely isolating the dad. It is so essential to not just present a united front to your child but also to make your child feel like a part of the team, to talk to them about certain decisions and to ask them how they feel about things. 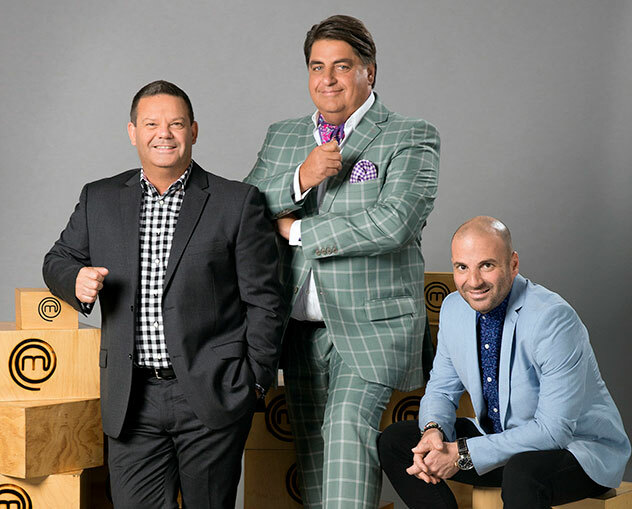 Looking at MasterChef Australia at a glance, the show does not seem to have made many changes in terms of format and judging over the years. But there have certainly been changes. Season 1 had a host, whereas the subsequent seasons saw the judges doing all the commentary themselves, which I thoroughly enjoy. Slight trimming and tweaking here and there have brought us a refined Season 10. What I especially enjoyed this season is that the winner of the Mystery Box challenge got to head up straight to the gantry and skip the invention test. Earlier, the mystery box winner got only an ingredient advantage and the winners would frequently find themselves in the bottom 3 at the end of the day. We all take comfort in the familiar and find ourselves resisting change. And kids normally thrive in structure and routine. Watching the show I thought about all the things I want to change in our family lifestyle this year. Normally I would tend to get excited and change many things all at once and then get overwhelmed in a week but now I am seeing the upside of gentle changes. Little by little, moving bed times by half an hour, reducing TV time by 15 minutes. Easy does it. Everyone on MasterChef Australia consistently talks about food. Not about other people, not too much about backgrounds but food. The judges do use “beautiful human being” for a lot of people but other than that, they stick to the dish in front of them. What did it lack? Seasoning. It was undercooked / overcooked. I love how balanced their feedback is. Based on how the cook went on a particular day, we have seen many front-runners exiting the competition early on and many cooks that seemed average in the beginning find themselves in the top 3 or 5. I love how the judges use their words. There is no unnecessary name-calling or profanity. There is no spitting-out of food or throwing it into the trash. The only time they actually refuse to eat something is when the protein is undercooked. This show has taught me so much on how to talk to Rumi. How to try to use different words when I say something or write it (succulent, tender, more-ish, heavenly instead of yummy all the time!) To focus on the good things and deliver any negative feedback objectively and precisely so that the person on the receiving end knows exactly what they could have done better. The three guys at that tasting table really do a fantastic job here. MasterChef Australia gets the feel of the space just right. From the mellow, yellow lighting to that green, abundant garden, it feels like a place that hosts hearty meals served with warmth and love. Why do they do that hideous neon, generic mall type lighting in MasterChef USA? It feels cold and sterile. Since none of these versions have budget restrictions, it goes to show that you can do a lot with the feel of your space, without being limited by money or by the actual size. Just a new lamp, carpet, rearranging the couch and chairs; a lot can be achieved by simply taking the time to think about it. Now to wait for another year before we get mesmerized by all those gorgeous plates of food again. Previous Post Freedom, after 8 long years!